Chinese Laundries in Charleston, S. C.
Charleston was a thriving city of the Deep South during the middle 19th century. Like other southern cities, there never were more than a few Chinese in Charleston where almost everyone was either black or white. In 1888, Charleston had 22,699 whites and 27, 285 coloreds, which included only nine Chinese. Among the first Chinese listed in the 1880 census for Charleston was William Ah Sang, recruited for his knowledge of Chinese tea to work in a prosperous teashop. The aristocratic members of Charleston during the 19th century held Chinese decorative art and home furnishings in high regard and promoted the growing “China Trade.” A few missionaries brought Chinese boys to their homes as domestic servants. However, most early Chinese in Charleston owned or worked in laundries. The City Directory showed that from 1870 to 1973, there were as many as 17 laundries between 1900 and 1909 when they peaked. In the 1920s the number began to dwindle, leaving only 2 in the 1960s. The first Chinese restaurant opened in the 1920s but there were never more than 3 at any time before 1973. One Chinese grocery store existed as early as the 1870s but there was never more than one during any decade before the 1970s. 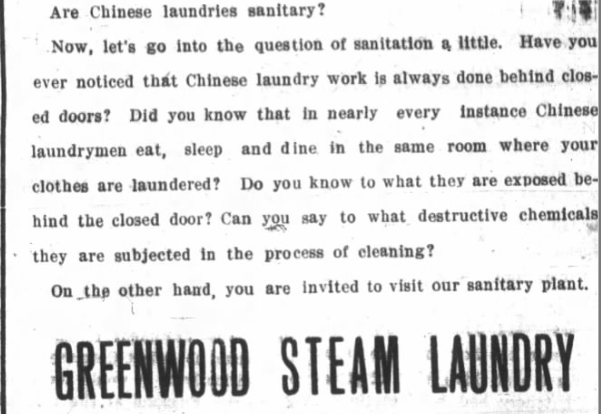 By 1899, strong hostility toward Chinese laundrymen had developed in Charleston as illustrated by a newspaper article, “Too Many Chinese,” that called for increased license fees for Chinese laundries, which were dominating that business. The article quoted the reaction of one laundryman protesting the unfairness of the increased fee by arguing that Chinese did not make trouble like the blacks or Mexicans who also paid no license fees at all. 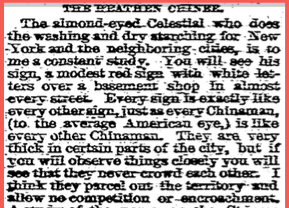 Although the Charleston writer of the following passage describing Chinese laundrymen in a letter printed in 1886 was referring to his observations in New York City, it reflects prevalent negative attitudes about the Chinese in many regions of the country. The ad criticized the Chinese for sending money back to China and not spending locally to help the American economy. Finally, the charge was made that Chinese laundries were unsanitary. 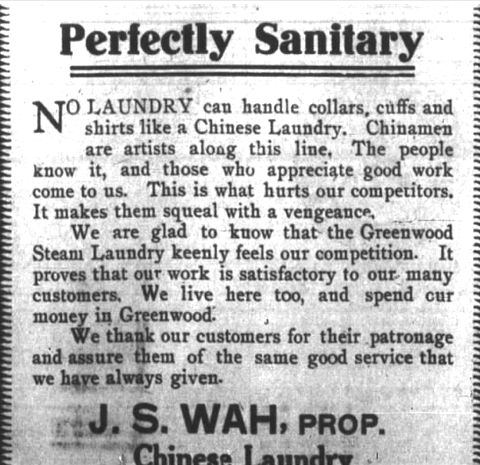 Wah cleverly deflected the charge of the steam laundry ad, “We are glad to know that the Greenwood Steam Laundry keenly feels our competition…We live here too, and spend our money in Greenwood.” He diplomatically closed his ad by thanking customers for their business and promising the “same good service that we have always given.” Clearly, J. S. Wah was no dummy with respect to public relations! Moreover, he was not only adept at defense, but expert in taking the offensive as shown in his ad promoting his laundry. 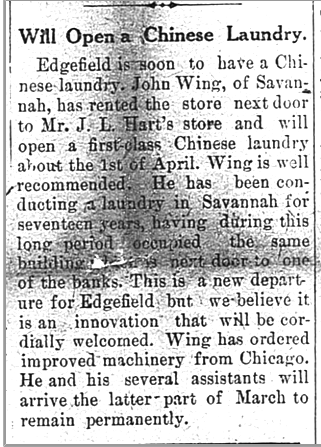 Although most communities accepted Chinese laundrymen, but not as enthusiastically as in Edgefield, the Chinese were often at risk for robbery and violence. In 1928, Charley Loy, a laundryman was robbed and murdered. Four black men were arrested and sentenced to die in the electric chair for his murder. This was not an unusual case. Chinese laundrymen, working late and often alone, were often prime targets for robbery, assault, and homicide. In the same year, two Chinese laundrymen suffered were attacked and robbed in their laundry in Spartansburg, S. C.
Were Chinese Treated As Black or White? Few Chinese men in Charleston or elsewhere in the South had Chinese wives with them due to immigration exclusion laws prohibiting laborers from bringing their wives and children from China. In Charleston there were five known instances of Chinese men marrying non-Chinese women, 2 white and 3 of mixed race. Whereas children of Chinese married to white women were treated as white, and allowed to attend white schools, those of Chinese married to mixed race women were considered as black and restricted to black school. Around 1947, one Chinese, Chung Lum, married to a light-skinned colored woman, devised a strategy for getting their children admitted to a white school by changing his racial identity to distance himself and his children from his mother and siblings. They associated only with whites, attended a white church, and he worked as a Chinese interpreter for the Chinese embassy. This strategy worked for a while in getting the children into a white school but the following year they were prohibited when someone anonymously revealed that other members of Lem’s family attended a black school. In contrast to the second class status of working-class Chinese and their children in Charleston until the middle of the twentieth century, students coming from China to attend college were warmly accepted, Six Chinese from well-to-do families were cadets at The Citadel from 1926 to 1932. For a detailed study of Chinese in Charleston: Li, Jian. A History of the Chinese in Charleston. The South Carolina Historical Magazine, (1998) 99, 1, 34-65.